For a broad overview of my work, watch this lecture geared toward the public! Stewart, L.C., Algar, C.K., Fortunato, C.S., Larson, B.I., Vallino, J.J., Huber, J.A., Butterfield, D.A., and J.F. Holden. 2019. Fluid geochemistry, local hydrology, and metabolic activity define methanogen community size and composition in deep-sea hydrothermal vents. ISME Journal. https://doi.org/10.1038/s41396-019-0382-3. Walter, S.S., Jaekel, U., Osterholz, H, Fisher, A., Huber, J.A., Pearson, A. Dittmar, T, and P.R. Girguis. 2018. Decomposition of marine dissolved organic matter in cool oceanic crust. Nature Geosciences. 11:334–339. Van Dover, C.L., Arnaud-Haond, S., Gianni, M., Helmreich, S. Huber, J.A., Jaeckel, A.L., Metaxas, A., Pendleton, L.H., Petersen, S., Ramirez-Llodra, E., Steinberg, P.E., Tunnicliffe, V., and Yamamoto, Y. 2018. Scientific rationale and international obligations for protection of active hydrothermal vent ecosystems from deep-sea mining. Marine Policy. 90:20–28. Fortunato, C.S., Larson, B.J., Butterfield, D.A., and J.A. Huber. 2018. Spatially distinct, temporally stable microbial populations mediate biogeochemical cycling at and below the seafloor in hydrothermal vent fluids. Environmental Microbiology. 20:769–784. Tully, B., Wheat, C.G., Glazer, B., and J.A. Huber. 2018. A dynamic microbial community with high functional redundancy inhabits the cold, oxic subseafloor aquifer. ISME Journal. 12:1-16. Anderson, R.E., Reveillaud, J.C., Reddington, E., Delmont, T., Eren, A.M., McDermott, J.M., Seewald, J.S., and J.A. Huber. 2017. Genomic variation in microbial populations inhabiting the marine subseafloor at deep-sea hydrothermal vents. Nature Communications. 8:1114. Meyer, J.L, Jaekel, U., Tully, B. Glazer, B.T., Wheat, C.G., H-T, Lin., C-C, Hsieh, Cowen, J.P., Hulme, S.M., Girguis, P.R., and J.A. Huber. 2016. A distinct and active bacterial community in cold oxygenated fluids circulating beneath Mid-Atlantic seafloor. Scientific Reports. 6:22541. Fortunato, C.F. and J.A. Huber. 2016. Coupled RNA-SIP and metatranscriptomics of active chemolithoautotrophic communities at a deep-sea hydrothermal vent. ISME Journal. 10:1925-1938. Reveillaud, J., Reddington, E., McDermott, J., Meyer, J.L., Algar, C., Sylva, S., Seewald, J., German, C.G., and J.A. Huber. 2016. Subseafloor microbial communities in hydrogen-rich vent fluids from hydrothermal systems along the Mid-Cayman Rise. Environmental Microbiology. 8:1970–1987. Ph.D.: Biological Oceanography and Certificate in Astrobiology. 2004. University of Washington. Julie is an oceanographer by training and is broadly interested in how basic earth processes- rocks forming, fluids moving, sediments accumulating- interact to create and maintain life in the oceans. Her research addresses some of the most central questions about the nature and extent of life on Earth in one of its least explored corners, the subseafloor habitat beneath the ocean floor. Her work is universal for understanding the impact of microbial life on both human and planetary health on Earth and beyond. March 2019: Postdoc Amy published a chapter of her PhD thesis on microbes living on rocks below the subseafloor. Read it here! February 2019: Julie and colleagues published a manuscript on how chemistry and hydrology shape methanogenic communities at Axial Seamount. Read it here. December 2018: Postdoc Elizabeth is at sea on an early career training cruise and got her first dive in Alvin! Learn more here. December 2018: Julie was quoted in this fun radio story about subsurface life on KQED. November 2018: Julie and Chris Preston from MBARI published this opinion piece about bringing science to the seafloor through innovative technology. November 2018: Julie will be joining StarTalk on November 14 at Beacon Theater in NYC with Neil deGrasse Tyson, Ellie Kemper, and other guests. November 2018: Postdoc Sarah published a review paper about protist diversity with her PhD advisor Dave Caron. Read it here. October 2018: Learn more about the "below-ground biome" as featured in this article in The Scientist magazine. October 2018: We are excited to welcome postdoc Dr. Sarah Hu to the lab! She is a C-DEBI fellow who works on microbial eukaryotes in the ocean! October 2018: Julie joined colleagues Bob Ballard, Kevin Hand, and Chris German at National Geographic for an evening talk and panel on Exploring Ocean Worlds. Check out some pictures from the event here. October 2018: Congratulations to postdoc Elizabeth Trembath-Reichert, who just received the L'Oréal USA Fellowship For Women In Science. Learn more about Elizabeth's awesome work here! September 2018: We are excited to welcome postdoc Dr. Ashley Bulseco-McKim to the lab. She is working between our lab at WHOI and Dr. Joe Vallino's lab at MBL. Learn about her project here. 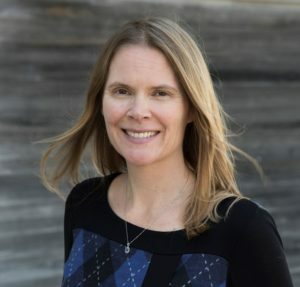 September 2018: Julie was featured in a Podcast for the AirSpace Museum about Ocean Worlds. You can listen here! September 2018: Julie was featured in the Boston Globe about the lab's cruise to to Lōʻihi Seamount. You can read more here! 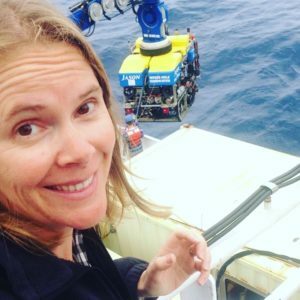 August 2018: Julie was on NPR's Science Friday to talk about the lab's cruise to Lōʻihi Seamount. You can listen here! August 2018: Postdocs Amy Smith and Elizabeth Trembath-Reichert are off to sea! Watch live ROV dives at Lōʻihi Seamount at Nautilus Live through September 10. July 2018: The lab is busy getting ready to head to sea! We will be joining a NASA, NOAA, and OET supported mission to the underwater volcano Lōʻihi Seamount. Learn more here! June 2018: We are excited to welcome our undergraduate interns from Cape Cod Community College. Learn more about this local internship program here! May 2018: New publication from Julie & colleagues about carbon cycling beneath the seafloor. See the press release and paper to learn more! April 2018: New perspective from Julie & colleagues around the globe about microbes and their niche. See the press release and paper to learn more! March 2018: New publication arguing that all active hydrothermal vents should be protected from deep-sea mining. Read it here! Feb 2018: Congrats to postdoc Elizabeth Trembath-Reichert for receiving the National Academy of Sciences Cozzarelli Prize for her recent publication in PNAS about deeply buried life beneath the seafloor.